There are so many benefits to using carrot oil for skin care and hair care that once you know of them, they’ll make you want to stop using conventional products altogether and go for all-natural. As with many other natural ingredients, carrot oil also goes back a long time and old references indicate that our ancestors used carrot seed oil not just for cosmetic purposes, but to treat conditions such as indigestion, diabetes and heart disease among others. Food manufacturers use it today to flavor food products like puddings, baked goods and soups while the cosmetics industry uses carrot oil as an active ingredient in soaps, creams and detergents, adding extra benefits to a product. However, the majority of these cosmetics contain not-so-good ingredients that you may want to avoid in your personal care products, in which case using simple carrot oil – mixed with a carrier oil or carrot oil in combination with other natural ingredients can work wonders for your skin issues. To convince you to use carrot oil as a personal care product, here are some of its benefits. It kills certain bacteria and fungi – carrot seed oil can help fight against dermatophytes, an infection that affects nails, the skin and the hair. It fights against other bacteria as well and viruses. It protects against UV rays – the oil has an SPF of around 40, meaning it is highly efficient at blocking UV rays and protecting your skin. While it needs other natural ingredients to be able to offer this protection, carrot seed oil is guaranteed to be useful in natural sunscreen recipes. It moisturizes the skin and hair – high in antioxidants, carrot seed oil is efficient in treating abscesses and boils. It moisturizes the skin and helps fight acne. Simply apply the oil to face with a cotton swab, let it dry, and let it work overnight. It helps remove dandruff – carrot oil is one of the most recommended ingredients for dry scalps. Apply a small patch on your hair to prevent any coloration and leave it on for as long as you can before washing your hair as you usually do. Carrot oil may color your scalp, but it won’t affect the color of your hair. You can use carrot seed oil as hair mask and facemask, which in combination with other ingredients, is going to keep the skin and hair smooth and moisturized. Here are two ways you can incorporate the oil as part of a regular beauty routine. Carrot oil mask for hair care. Use one carrot, one banana and a little bit of olive oil to make a paste for your hair. Blend the ingredients, apply the mask to your scalp and hair, leave it on for about 30 minutes, then rinse off and wash with a shampoo. 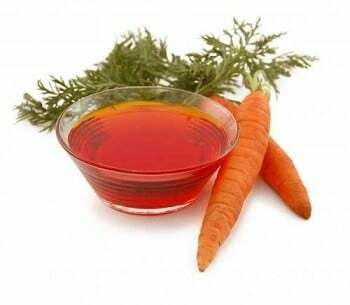 Carrot oil mask for face care. Make a mixture of carrot seed oil, lemon juice, one tbsp honey and feel free to include carrot paste for a facemask to treat acne. Apply to cleansed face and rinse the mask off after 20 minutes. Carrot seed oil is easy to find in stores, including the bigger grocery stores in the country. When shopping for it, look for cold pressed products to get the best benefits.